EquityTouch, the deal sourcing collaboration CRM, now includes support for Outlook® 2010, robust document management, and improved search results. Used by Private Equity and Venture Capital firms, EquityTouch’s latest release includes numerous system enhancements and plug-in improvements. The application is based on the “Touch” concept. A Touch is any interaction between people or companies such as emails, events, phone calls, and meetings. These Touches are then organized in the application by company, contact, and Touch type for easy reference. Outlook 2010 Plug-In – The EquityTouch Plug-In for Microsoft Outlook® now supports Outlook 2010. Users can download the plug-in through the “Tools” section of EquityTouch. The plug-in integrates seamlessly with Outlook and allows users to send contacts and emails directly to the application. Custom Touch Fields – Administrators can now add custom fields to Touches, and are able to customize the layout of the Touches. Hierarchical Parent/Child Fields – Administrators can now create Hierarchical (Parent/Child) fields in EquityTouch. The Administrator can define “Parent” fields which will display different options in the “Child” field dependent on which list item is selected. Improved Document Management – When a user uploads a document, a Touch is created to record the upload and has the document attached with it. You now have the ability to delete documents from the database. To delete a document, the Administrator must delete the Touch associated with the upload. Any technical questions/concerns can be directed to Touch Ahead Support via email (help@touchahead.com) or phone (1-866-960-9301). Get more information on EquityTouch</> or request a demo now. 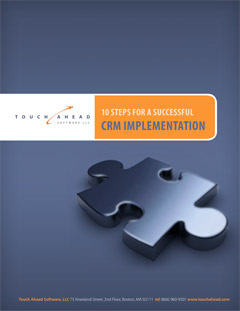 This entry was posted in News and tagged CRM, EquityTouch, new features, venture capital. Bookmark the permalink.